Autograph A-6(1) is the earliest dated music manuscript of Diepenbrock to have been transmitted. It is a loose sheet with on the front side only the first strophe of the composition and on the bottom half of the backside a four-measure correction and the ritornello of the piano part. In this document no title is given and the first line of text is “Ik heb haar als mijn ziel bemind” (I loved her as my soul) instead of “Ik heb haar in mijn hart bemind” (I loved her in my heart). On the top half of the backside of the sheet the first lines of Ludwig Uhland’s ballad Der Schäfer (The Shepherd) are written in Diepenbrock’s hand; beneath this, in Diepenbrock’s father Ferdinand’s hand, is the comment that Heine included this poem in his book Die romantische Schule (The Romantic School; see RC 0: Lost Works). The note in the margin by Ludgardis, Diepenbrock’s youngest sister, must be of a later date, possibly even after his death. If the entry on my sixteenth year refers to Ludgardis’ sixteenth birthday, she would have received this manuscript on 3 July 1888. Diepenbrock’s family has always been convinced that he wrote this song especially for his second cousin Luise Diepenbrock (1862-1950), who lived with her parents in Amsterdam from 1875 to 1878 and often played music with him, as she recalls in her letter dated 22 November 1905. (BD V:40) In 1879 she got engaged to Arthur Bäseler and they married in 1883. As Antheunis’ poem Blauw, blauw bloemelijn (Little Blue Flower) describes a similar situation as Der Schäfer by Uhland, one may well presume that Diepenbrock was secretly in love with Luise and that her departure strongly affected him. The notation of A-6(1) suggests that the design of the song was purely strophic. The work has a through-composed fourth and fifth strophe in autograph A-49(11), which is bound in an album of Diepenbrock songs of the alto Cato Loman, a good friend of the family. 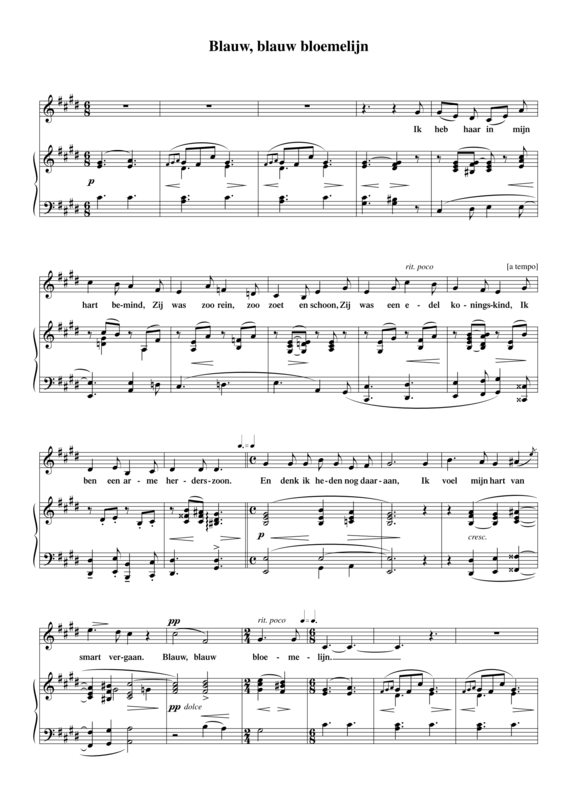 In this version the first line of text corresponds with the poem and the opening measures of the piano part are more harmonically refined. It is assumed that Diepenbrock compiled this manuscript in 1888, before presenting the original version to his sister. Ik ben een arme herderszoon. Ik voel mijn hart van smart vergaan. Ik ging met kloppend hart voorbij. Zij was gebleven waar zij stond. Ik drukte ’t stil aan hart en mond. Daar kwam een kongingszoon, o wee! Hij voerde ze over land en zee. Zij blikte treurig neer op mij. Voor mij was vreugd en hoop voorbij. Mijn harte zal van smart vergaan.